An Afghan prison built with millions of dollars of American money and already crumbling has once again raised questions about the effectiveness of US aid in the country. A report by the US Inspector General for Afghanistan Reconstruction, Sigar, says that Baghlan prison in North Eastern Afghanistan needs major repairs, just 18 months after it opened. Baghlan prison sits on a sandy plain, ten miles drive from the nearest settlement. As you approach it, the facility appears impressive, a self contained village covering an area of around 4 sq km. But once you get past the security guards, it doesn't take long for problems to become apparent. Large parts of the facility resemble a building site. There are cracks in walls and some buildings are deserted. According to Sigar's report, building settlement occurred just a few months after the prison was finished in late 2012. 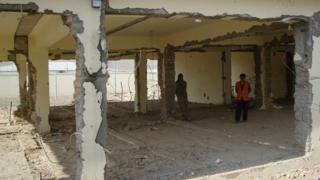 Cracks appeared in three major buildings, including the maximum security housing and one building had to be demolished. "The way it was build with brick and mortar is not really a good way to house prisoners because they could probably scrape through the walls and break out." he said. It's a big headache for the head of the prison, Mohammad Yahya Qara who told me he fears things could get worse. "This site has not been a very good place to build a prison," he says. "All around there are mountains and monsoon rains and floods always threaten the prison." A few months before the facility was opened, a major flood engulfed the site. The Afghan company which constructed it, Omran Holding Group (OHG), says it was such flooding as well as other factors outside its control, which led to the damage. The president of OHG, Mohammad Naser Ahmadi told the BBC that when they handed the building over, the Americans evaluated it as "outstanding". "We had all the material, the concrete, the reinforced bars tested. We always had our quality check teams on the site," he says. But INL the US agency which commissioned the prison believes that the ground was not properly compacted before building started, leading to the problems. While both sides try and work out who foots the bill for the extensive repair work, the approximately 700 prisoners are left to live in overcrowded conditions. Inside the buildings it is dark. There is little electricity and irregular water supplies. The place is stifling hot and depressing. One prisoner, Mohammad Yunus said conditions could hardly be worse: "It is not hygienic, it is hot and we barely have drinkable water," he told me. Another prisoner bemoaned problems with the water supply and electricity cuts. Such complaints chimed with what Sigar inspectors found: apart from the structural problems, their report highlights a lack of proper maintenance at the prison. For example two generators meant to power the prison have broken down because no-one knew how to look after them properly. Repair work is under way now and a US aid programme is training mobile maintenance teams to look after Baghlan as well as other Afghan prisons. But questions remain over the effectiveness of US Aid and the way projects are implemented. Asked how much money is wasted through problems like those observed at Baghlan prison, Gene Aloise, Sigar's deputy inspector general simply says "Too much". "We've seen a lot of this," he told the BBC. "Practically with every one of the audits and investigations we find some major problems because of lack of oversight by the implementing agency." This is where our reporters share stories beyond the daily conflict and politics of a country going through the most important election in its recent history as foreign troops withdraw. We'll focus on the surprising while treating the familiar from fresh angles, combined with a street-level view of a country in transition. Most of the posts will be written, photographed or filmed by our journalists across Afghanistan. You can use #BBCAfghanNotebook to follow our reports via Twitter.